I present to you this prize of my recipe collection with what can only be described as…guilt. My mother recently asked what I’d be posting in the lead-up to Thanksgiving. I knew she had pie on her mind because that is the topic of the hour at any given time in our house, starting at the outset of November. You’ll find her at the kitchen counter making lists for Thanksgiving, and most of that list will be dedicated to her pies. When we’re buzzing along in the car on a five-hour trek through the flatlands of her home state of Ohio, as we did just last week, for example, all of our conversational roads lead back to pie. There will be at least four pies on our Thanksgiving table for our small-ish group of eight. We’ll have much pie leftover, which is exactly the point. I’m finally coming to understand that Thanksgiving dinner is more about leftovers than it is about Thanksgiving dinner. Leftover pie for breakfast (lunch and dinner too) the day after Thanksgiving is a sacred ritual at our house. Bathrobe, cup of coffee, piece of pie. Conversation will be about which pie was best. My mom loves to tell the story of how her own mother, Alice, would push a piece of pie across the table to my father, who she adored, and say: A little piece of pie won’t hurt anything. Now. Chocolate-caramel pecan tart is better than good. It is amazing. Everyone who I have ever watched take a first bite gasps, talks with their mouth full to say Oh!, Oh my good God, and closes their eyes to take in the luscious flavor of caramel, salty toasted pecans, and chocolate. A pecan tart is not, however, pie. It is a tart. There is a difference. According to my mama, a big difference whose gap is so wide it cannot be crossed. Why not a pie?, was my mom’s question when she heard the word “tart.” You’ve never done a pie for them, actually, she said. What in the…. She is right; I scoured my back-posts and see that no, I have not posted about pie. I do love to bake pie, I promise you that, and have been making them with my mom’s spectacularly good crust for a lot of years. I like her flakey pie crust far better than any tart crust I’ve ever eaten. Pie is one of my mother’s great legacies of the kitchen, a love passed from her own mother to her, precious like the diamond lavaliere necklace worn around Grandma’s tiny neck on her wedding day and now resting in Mom’s velvet-lined jewelry box for similar special occasions. How could I not post about pie, especially at Thanksgiving. Forgiveness was found, though, when I told her which tart we’d be making. She knows how good it is, and remembers that we often had this tart at one of our favorite Chicago restaurants, Mon Ami Gabi, over the years when she and my dad would visit my sister and me, and then on her own in the many years since he died. I loved the tart so much that I published my first piece of “food writing” for it when I wrote to Bon Appetit’s R.S.V.P. department and asked if they could get the recipe. They did, and they published it, and it’s still online here. The thing made me a kind of dining rock star back at Mon Ami Gabi, where one of my dinner companions, my dear friend Ed, once told the waiter just who he was waiting on. I blushed, but only for a moment, because then the chef came out and told me the Bon Appetit column was taped to the wall in their kitchen, and here you go, a slice of tart on the house. I admit that happened more than once because from then on they knew who I was when I came a-eating-dinner there. Usually I took my tart to go, though, to eat for breakfast the next morning. This luscious tart tastes excellent chilled, which makes it an ideal make-ahead dessert (one day ahead). The crust can be made far in advance and frozen, unbaked or baked. 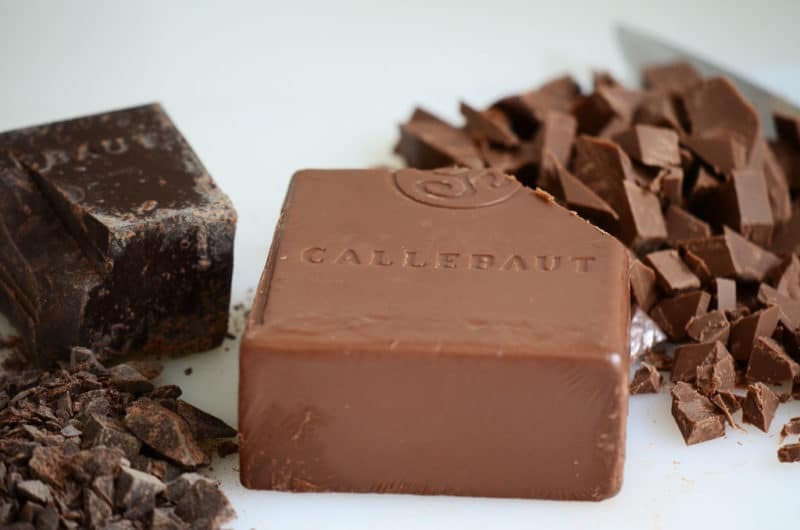 Use high quality chocolate (not regular chocolate chips; they resist melting) like Green & Black’s, Scharffenberger, Callebaut, or Lindt. Blend the flour, sugar, salt, and almonds in a food processor until the nuts are finely ground. Using on/off turns, cut in the butter until a coarse meal forms. Add the egg and blend just until dough sticks together when pinched. Dump the dough onto a piece of waxed paper or plastic. Gather the dough into ball with the paper; flatten into a square 1-inch thick, wrap, and chill 1 hour. Line the bottom of a 9.5- or 10-inch round removable bottom tart pan with parchment paper. Cut the dough into 1-inch slices. Lay the slices in the bottom of the pan and push them together, closing all fissures completely. Line the edges of the tart with slices of dough placed horizontally around the fluted edges. Press this dough into the bottom of the crust, closing all fissures, and into the fluted rim. Refrigerate for one hour. Preheat oven to 375°F. Bake the crust until golden brown, about 17 minutes. You will notice that the crust is somewhat puffed up; this should be tamped down with the flat bottom of a glass. Read a few tips about making caramel. Stir sugar and corn syrup in a heavy small saucepan over medium-high heat until sugar dissolves. Stop stirring and boil the mixture until the syrup turns golden brown, swirling pan occasionally, about 4 minutes. Stir in 1 cup whipping cream (mixture will bubble vigorously). Stir over the heat until any caramel bits dissolve. Remove mixture from heat. Place milk chocolate and honey in medium bowl. Pour caramel over and let the mixture rest for a couple of minutes while the chocolate melts. Whisk until chocolate is melted and the mixture is smooth. 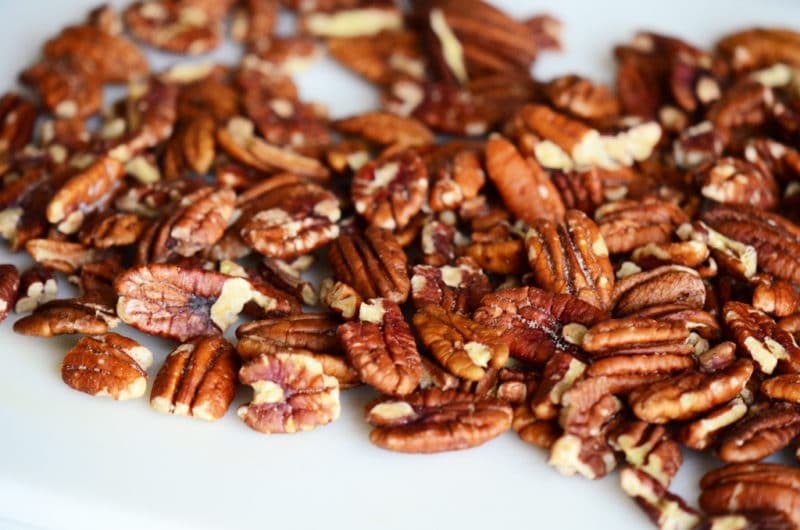 Stir in chopped pecans. Transfer filling to crust. Chill until set, about 4 hours or overnight. Place the chopped bittersweet chocolate in small bowl. Bring remaining 1/3 cup cream to boil in small saucepan over medium-high heat. Pour over bittersweet chocolate; let the mixture rest for a couple of minutes while the chocolate melts. Whisk until smooth. 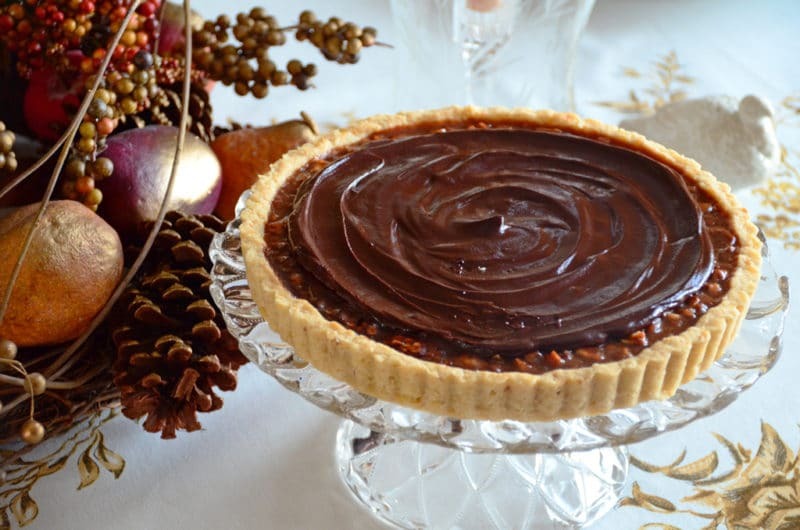 Pour chocolate mixture evenly over tart. Refrigerate until firm, about 1 hour. (Can be made 1 day ahead; keep refrigerated and serve chilled) Remove the tart from the fluted ring. Use a flat metal spatula to lift the tart off of the metal tart pan bottom. Place on a serving platter, cut tart into wedges and serve. Serves 8. 18 Responses to "Chocolate-Caramel Pecan Tart Recipe"
Good thing I will be at the Aboods the day after Thanksgiving this year!!!!! 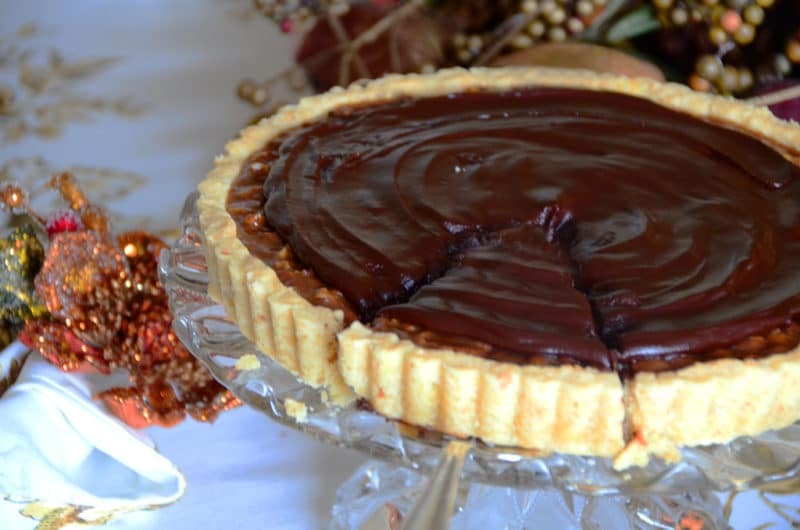 From the looks of this tart, you appear to have stumbled onto a legal form of crack. That dessert looks outrageous? Why can I not teleport to your table? When are you going to open up a business for us mouth watering individuals? 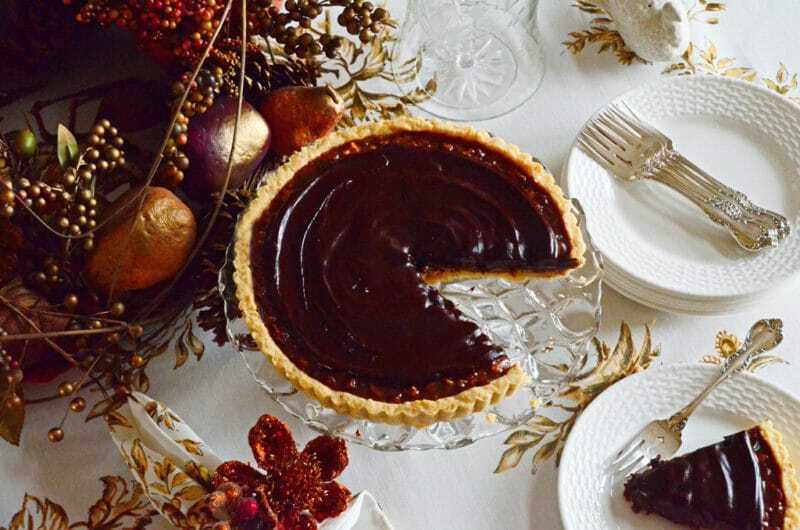 The Chocolate-Carmel Pecan Tart sounds so good. Love your one-word description for the tart: GUILT. Im feeling a little guilty for not posting and letting you know my delight in each and every post! Each day (weekday that is) i look so forward to opening my email and looking for Maureen Abood. Its like opening a special gift each morning, I feel so lucky to be one of your recipients. I love you sweet cousin! This must be an oddity on my part, but I have preferred chocolate cake and pies chilled since I was a little girl, so this is the recipe for me, for Thanksgiving, I think. My mother is 90 and I want to make the meal very special for her. I am not adept with crust, so my version will have a “rustic” look, unlike yours, but I trust your taste, and am so happy to have something new, delicious and special to make. I am very intrigued by a recipe where Green & Black’s (love it) and Lindt (do not love it) chocolate are both recommended for use. Susan, enjoy! This tart is a treat! Susan, great questions–thank you! I don’t prick or weight this crust for blind baking and just tamp it down later–but if you want to weight it that will work fine. I wouldn’t prick, because those can sometimes create holes that the filling seeps through. Great! Thanks for clarifying. I am going to sub Lyle’s golden syrup for corn syrup, because my mother is allergic. After reading the crust recipe more carefully, I realized that there is a possability mine will turn out looking half way civillized. Rolling out crust is usually my nemesis. This is the first Thanksgiving dinner that I have been excited about preparing in a long time, because I have a new dessert to make. P.S. I’m using the tahini sauce for the roasted butternut squash over green beans instead. Thank you for enriching our Thanksgiving dinner! OMG, Maureen! I just finished my tart and it is gorgeous! I can’t believe I made it. The tart crust is really more like a cookie dough; the almonds made the dough more flexible, kind of like almond paste. The filling is ambrosial – the touch of honey is genius. I can’t wait for my daughter to wake up and see it! (Since it is 4:35 am, I am refraining from actually waking her up.). Right now I am happier than I have been in a long, long time. The recipe is perfection. I would have been tempted to hoard it. Thank you, Maureen! Thank you for sharing this with me, Susan–so special! is this what would happen to a demet’s turtle in the best of all possible worlds? Hi Maureen, I made this for Christmas and everyone loved it. However, I struggled with the carmel. The first batch, I cooked the syrup until light brown (6-7 minutes), then added the cream. The cream came right from the refrigerator, but did not foam up and the sugar immediately formed a sugar crystal. The second batch I cooked for four minutes, it only turned a slight golden tint, once again the cream did not foam, but we continue with the recipe. The tart set and turned out okay, but do you have any idea what I did wrong or why the whipping cream would not foam? 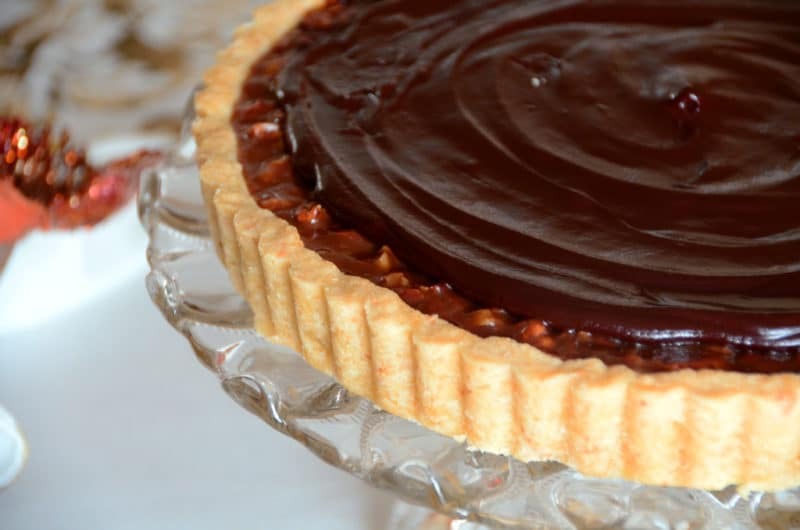 Hi Julie–so glad you made this delicious tart! For the caramel, it will always form solid pieces when you add the cream; just keep stirring over the heat until it melts. Agree the caramel has to be cooked until deep amber in color. I have never seen caramel not foam when cream is added. I think the key here is that the caramel can continue to be cooked until those solid pieces melt.